Row, row and row some more! On August 8th we will launch from Reading and row a 100km stretch of the Thames to the historic town of Richmond over two days with a nights camp in the middle On the way we will pass new towns and old castles, Victorian water works and under four motorways. As is fitting for Challenge12, this will push our endurance to it's limits. Particularly for Rob, unaccustomed as he is to any vehicle without an engine! Only the brave or the foolhardy need apply. Through friends and family he finds you. With wit and charm he lures you in. Just a small thing...a trifle really....you'll enjoy it.Then you're hooked. You commit body and mind to 'The Challenge'.This pied piper of a man is Andy Connolly.We are his captains. Tash and Rob have been good friends for years. Rob first appeared on the Challenge12 radar through his sister Vicky, who has been a participant and captain since year one. Being a truck and bus driver, Rob was asked to provide logistical support on a couple of early challenges. He responded with enthusiasm and was convinced to partake in a few challenges himself including a 25km row. Now he and Tash have joined forces to bring you an evolution of that event. 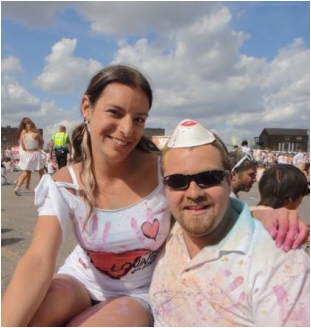 Tash is a sparkly ball of rainbow energy, and (fittingly) joined the Challenge12 team on the Colour Run in 2013. With the power of glitter, she is always up for a challenge and loves pushing herself to the limit. Rowing is a new venture for her, but she'll take it on with extreme enthusiasm. The statistics tell us that 1 in 3 people in the UK will have their lives affected by cancer. It feels like much more than that.This is an unacceptable blight on our society and anything we can do to stop it should be done. You can be part of the solution. All you have to do is put your hand in your metaphorical pocket. Whether it's you or someone close to you that's been affected, you know the effect this tragedy can cause.Cancer Research UK fund scientists, doctors and nurses to bring an end to cancer. Each step they make towards beating cancer relies on every pound donated. Their policy development team develops evidence-based policy to inform Government decisions related to cancer and cancer research. We can help them beat cancer sooner. Do I need to say more?